OneKind is delighted to be part of a powerful new initiative launched today to tackle the illegal puppy trade in Scotland. The project is led by the Scottish SPCA in collaboration with the Scottish Government, Edinburgh Dog and Cat Home, RSPCA, Battersea, Dogs Trust, Trading Standards Scotland, Blue Cross, OneKind, BSAVA and the University of Edinburgh. The aim is to raise awareness and encourage people to buy puppies responsibly, helping to stem the demand for puppies who have been bred intensively and sold by unscrupulous puppy dealers. It’s an alliance that demonstrates striking unanimity across a wide range of partners, all of whom have knowledge of the devastating welfare effects of the puppy farming and dealing industry. This knowledge will be harnessed to bring about the meaningful change in public behaviour that is desperately needed, if this cruel trade is to be ended. Public behaviour in this area seems to be riddled with paradoxes. People know that puppy farming is wrong. And they must know that if they purchase puppies from advertisers with an ever-changing stock of puppies, or arrange to meet sellers in car parks, they are almost certainly buying into puppy farming. It’s not as simple as the quest for a bargain. One woman told us that she knew there was something “dodgy” going on, but when she saw the tiny, vulnerable creature, she just wanted to throw money at the seller and get the puppy to safety. It’s an understandable instinct and – despite all I know about the puppy trade – in those circumstances I’m fairly sure I would do the same. In fact, no-one can say they don’t know what is happening. We’ve all seen that film of the Dog Breeding Academy in County Fermanagh, where 500 adult dogs and their puppies were kept in conditions that Scotland’s Chief Veterinary Officer described as “barbaric.” We’ve heard harrowing accounts of very young puppies transported by bus from Lithuania to the UK, starving, vomiting, dehydrated and eating their own faeces. We’ve seen that doughty BBC Scotland journalist, Samantha Poling, confront aggressive traffickers in Northern Ireland and Eastern Europe. We’ve heard about puppies seized at ports by Operation Delphin, a multi-agency team involving the Scottish SPCA, Police Scotland, the Ulster and Irish SPCAs, HMRC, Border Force and local authorities. These operations and these exposés are all great work and without them the situation would be far, far worse. So why has public behaviour not changed? That was one of the questions examined by researchers from the universities of Northumbria and South Wales, for a report published by the Scottish Government last year. Unsurprisingly, they found that the internet is both the main source of information and the main conduit for making purchases. Consumers reported being overwhelmed and confused by the scale of the online trade, “but nonetheless believed purchases through online advertisements to be more reliable and regulated than is the case”. Despite the wide range of advice on offer from NGOs and authorities, people were still uncertain how to navigate through sometimes conflicting information. As is so often the case, the need for more education was identified. The traffickers rely on public confusion and misunderstanding to keep their market going. 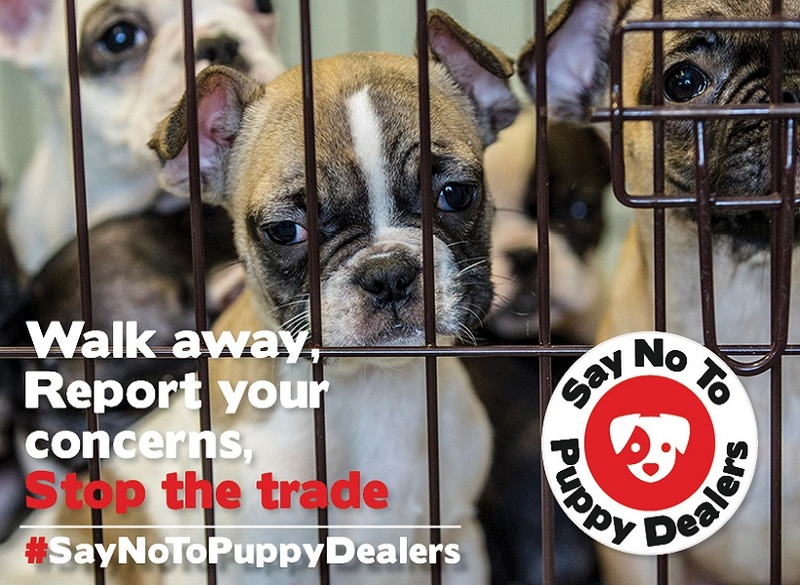 The puppy trade was estimated by the Scottish Government to be worth a conservative £13 million last year in Scotland alone and the dealers will not give up easily on these profits. And let’s not forget that there are still concerns to be addressed in the legal trade, as set out in the OneKind report into Scotland’s puppy profiteers. The new campaign spearheaded by the Scottish SPCA aims to make it easier to find a dog from an appropriate source, whether it is one of the dogs waiting hopefully in an animal shelter for a new home, or a puppy who has been bred both legally and responsibly. At the same time it urges people to pledge to say no to puppy dealers, and a strong response is expected to this plea. Taken together, and supported by a united coalition of partners, this dual approach has the potential to bring about a real reduction in animal suffering and family heartbreak. It is urgently needed. What can we actively do to help? I can see so many obviously dodgy ads, with third parties selling these pups. I want to help bust them! 8 years ago a friend of mine bought a German Shepherd pup from a woman on the East coast of Scotland. My friend was unaware of puppy farms and bought the pup in good faith having been promised paperwork from the Kennel Club veryifying the health and parentage but that never arrived. My friend reported the woman who was ordered to return the money that had been paid but before that could be enforced the woman took the poor dog’s and pups and disappeared. She had also been told that the puppy farm would be shut down and the dog’s would be taken away. I don’t know who was stupid enough to give the woman a warning because she is, no doubt, out there torturing and overbreeding and nobody knows where she is. My friend’s dog has subsequently had health problems although, luckily, they are not too serious. I detest puppy farming and detest the cruel people without a conscience who put intelligent animals through hell and torture them. There needs to be more media coverage of these people and places and they should be named and shamed because I have been shocked at the amount of people who still don’t know about this abuse. Thank goodness OneKind are fighting to stop this. There also need to be harsh penalties for the abusers, long prison sentences but all of the money these repulsive people make from the abuse should be given directly to animal shelter’s such as Munlochy in Ross – shire which is run by an amazing lady called Iona who has dedicated her life to saving animals and who is supported by public donations. Thank you so much to OneKind for working hard to stop our incredible friends being hurt and living a life of absolute hell and for showing people and politician’s that something has t be done to stop the suffering. This happens a lot and if human traders are persecuted so should happen to puppy traders, at the end of the day is ilegal to introduce animals in a different country without passing the quarentine and of course let’s just not talk about the suffering and stress that the little puppies go through. It’s not healthy and definetly is not human to treat these cute animals like that, scare them to hell from the very beginning just for a family who wants to save money on their pets.